Sangrita, Little Blood is a limited-edition book of new haiku handwritten by David Bellarosa on Guestcheck pads. It includes carbon copies of every page to be distributed to friends and loved ones at owners own discretion. He started writing it as a short order cook in Austin, Texas and finished it during his time living in Los Angeles, working as a locksmith. A single edition of this handmade book came with a small, sealed vile filled with the blood of David Bellarosa. TEJANA! is the third book of poems by David Bellarosa written mostly in Austin, Texas. Those mountains really are blue. Those mountains really are blue. is the second book of poetry by David Bellarosa written at his cousin Diana's cabin in the Blue Mountains outside of Asheville, North Carolina. FAR AWAY AT HOME is the first book of poetry by David Bellarosa, written before he left his home in New Jersey, New York, New England and Mexico. 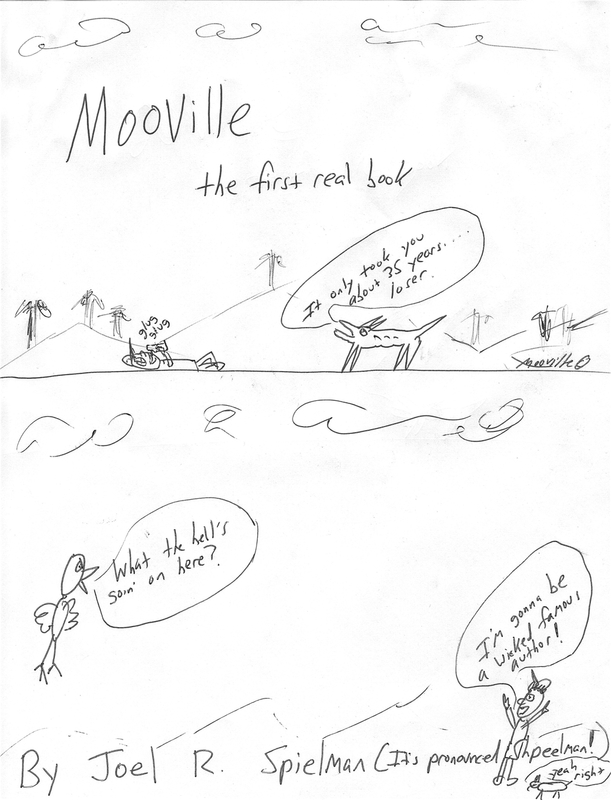 This is a collection of absurdist comic strips that take place in Mooville, a strange town filled with degenerate animals and war veterans, imagined by Lonely Giant Joel Spielman.